Last week I looked at how you know if you’re singing in tune. It turns out that it’s quite complicated and depends on many different factors. But what can you do to fix it if you are singing out of tune? This week I’m going to suggest some things you can try so that you can improve your tuning abilities. Of course, I’m sure I’ve missed out loads of ideas, so please let me know if you have any other methods which have helped you stay in tune. Do you need to be in tune with other singers, or with instruments? Will you be singing in unison or in harmony? A cappella or with backing? Practising for a karaoke night or a big performance with your choir? I’m going to focus this week on the process of discovering how you can match pitch so that you can sing in unison with others. Next week I’ll look in more detail at things you can do to improve your pitch matching skills. The week after that I’ll look at what can help you sing harmonies accurately, which means learning about the intervals between notes, how to recognise them, and how to hold on to them. In order to sing the correct pitch you need to be able to transmit a sound and also, at the same time, be able to listen to that sound and how it fits in with other sounds. Most people jump right in at the transmission stage without considering the perception/ listening stage! There are so many elements involved in producing a sound with the human voice, and many, many different muscles are involved in vocal production. We have to learn to have some control over this in order to be able to consistently produce the sound that we want. However, it’s not something that happens overnight. Think of how long it took you to learn to catch a ball when you were young, all that muscle control and hand-to-eye co-ordination. Now we need to learn some ear-to-voice co-ordination. First off you have to learn to listen, and I mean listen. learn how noisy a ‘silent’ room can be. This has to be the first step in being able to produce the right note at will: learning to really hear what is going on, to be able to listen attentively. This is vital even for experienced singers. As well as warming up the voice, we also need to warm up our ears before we begin to sing. Now we move on to the stage of producing a vocal sound. Somehow you will need to get some feedback as to whether you are hitting the right note or not. When you kick a football at a goal, you can see whether it hits the back of the net or not. As you begin train your ear, you will need some kind of feedback to tell you whether you’ve hit the right note or not. In the early stages of learning, your own ear is probably not the best judge! If you’re on your own, you could practice singing with an electronic tuner that shows visually when you are flat, sharp or on pitch. If you have a friend, singing buddy or teacher, then they can tell you when you’ve got the pitch right or not. Of course, the other person needs to have a good sense of tuning themselves! Play a note on an instrument like a piano, and try to match that pitch. Make sure the note is not too high or too low for you (see next week)! A good place to start is middle C in the centre of the piano keyboard. Then try to sing that note and look what the electronic tuner says. If you’re sharp, then you’re singing too high (above the pitch) and will need to bring your pitch down a bit. If you’re singing flat, then you’re singing too low (below the pitch) and will need to raise your pitch a bit. You will never get it exactly spot on – we are human after all! – so just aim to get pretty close. A tuner is good place to begin, and will give you a rough idea of whether you’re near the note in question or not. You may get quite good at this, but matching pitch with an electronic tuner is not the same as singing with other people or with a band! Perhaps a more realistic method is to have another person with you to tell you when you’ve got the pitch right or not. This could be a mate or a singing tutor. Basically, you try to match the pitch accordingly and your friend/ tutor will tell you if you’ve got it right or not. They will indicate if you need to go a little bit higher or a little bit lower (whether you’re flat or sharp). Play a note on the instrument. Try to match it with your voice. Possible problem: the note you’ve chosen is not within your singing range (see next week). Try to match the other person’s pitch. Possible problem: finding the right singing buddy (see next week). Try to match their pitch. 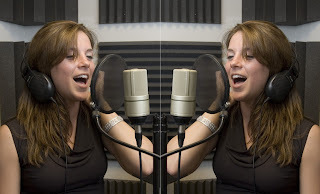 Possible problem: if you’re both singing at the same time, it might be hard for your friend to hear accurately that you’re both singing the same note (see next week). There is another way that you can tell if two people are singing exactly the same note. You will find that if you are spot on, it’s as if the air itself begins to vibrate. You have found a kind of ‘sweet spot’ which resonates in the room. The sound will appear richer and more textured and you might be able to hear other, sympathetic notes ringing in your ears. That means you’ve nailed it! I’m getting it wrong – what do I do now? Next week I’ll look at how you can learn to make the right adjustments in order to sing in tune with a given pitch.